We all know that we should eat healthy, but it can often be hard to pick healthier foods over the less healthy choices many of us love. Check out these 10 healthy food choices and alternatives to help you stay on track. This article contains affiliate links. Statistically speaking, if you made a New Year’s resolution to eat healthier, you’ve probably fallen off the wagon by now. I’ve certainly been there, done that and gotten far too many t-shirts. After all, with stressful lives without enough hours in a day, it’s easy to fall into old habits that are less work. Before I lost over 100 pounds, my diet was full of processed foods that weren’t great for me, and honestly, I still fall into that rut for a couple weeks now and then. I don’t believe in cutting out all “bad” foods completely as I think it just leads to binge eating from my personal experience. However, as we have worked towards a more primal lifestyle of natural eating, I do substitute healthy food choices and alternatives a majority of the time as you can find below. 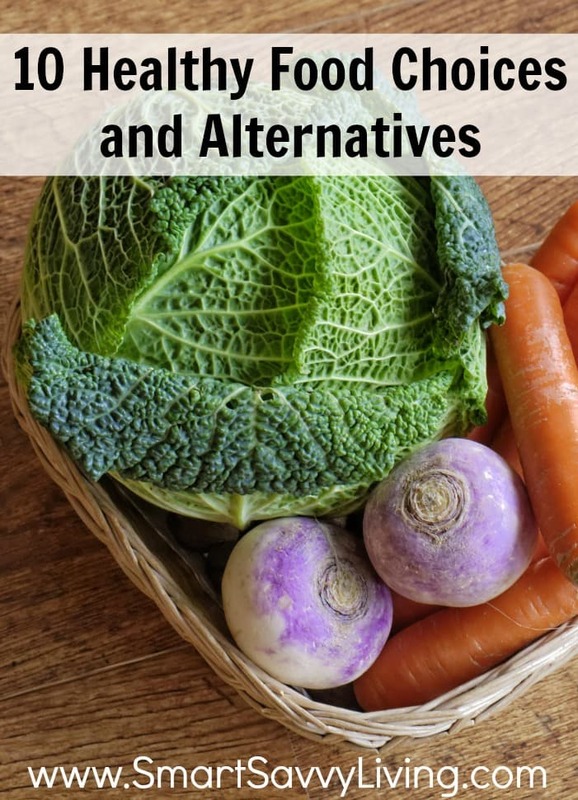 I didn’t immediately start with all of these alternatives, but instead opted to add them in slowly and really make it a new way of eating overtime as it’s far less overwhelming that way. The good news is that you do honestly start craving the healthier choices after a while because the less healthier options are just too sweet or don’t taste good. 1. Fried Chips – Instead of fried chips, I’ll have occasionally have baked chips, pretzels or air-popped pop corn when I really want the snacky foods. My biggest snack food love right now is actually pork rinds. Original versions are usually just the pork skin, fried in pork fat, and seasoned with salt and so crunchy and insanely delicious. If I want a crunchy side I’ve started having crunchy veggies like cucumbers or bell pepper strips that are lightly salted. 2. Mayonnaise – I love love love mayo, but it can add a lot of extra calories in a small serving. Plus, a lot of store-bought versions have unneeded ingredients, in my opinion, and I don’t always have time to make my own. Instead, I often use Greek yogurt or sour cream, especially in salads and dips. I also use Wholly Guacamole or mashed up avocado in place of mayo on sandwiches. According to the variety you use, you can save over 50% of the calories from regular mayo and know you’re eating wholesome ingredients . 3. Crackers – I love things like lean meat, cream cheese and other spreads on crackers (and even just plain crackers themselves), but find I generally eat way too many. While it isn’t a good base for nut butters, for cheeses and meats I really enjoy slices of cucumber as a healthier alternative to crackers when possible. 4. Ice Cream – Ice cream, how I love thee, but not for my waistline. While I do still indulge in real ice cream now and then, for healthier alternatives in between I go for frozen grapes or bananas. Frozen bananas can actually be mashed up and have a taste and texture very similar to ice cream. Sorbets can also be a good choice if not packed with sugar. 5. Candy and Sweets – Instead of super sugary candies I now opt for things like fruits, especially dried, or peppermints. As odd as it may sound, prunes (dried plums) are actually quite tasty and sweet. Peppermints tend to be on the lower calorie side and a strong peppermint flavor is said to help lessen other cravings you may be experiencing at the time. I really like these ones made with xylitol as they also help with dental health. 6. Milk Chocolate – Milk chocolate is still my favorite chocolate that I eat on rare occasions However to settle my chocolate cravings, I now go for a square of dark chocolate which is actually pretty healthy as it is packed full of nutrients and antioxidants that can help lower blood pressure, etc. Just remember to not overdo it as dark chocolate still packs a calorie punch. Alternatively, I’ll have some Greek yogurt sweetened with honey or Xylitol and mix in a spoonful of unsweetened cocoa powder. 7. Salad Dressing – I actually love salads, especially topped with a good ranch dressing, but I now save that for special occasions. For my more regular salad rotation I now opt for vinegar based dressings like Italian, often making my own. 8. French Fries – It’s hard to not want fresh fried french fries. However, I find I can still satisfy my french fry desire with baked fries or potatoes wedges that have been baked to be crispy. I also really love sweet potato fries. 9. Seasonings – Growing up in the South having fried foods or dishes covered in butter and salt was the norm for me. Now I try to cook with healthier methods like sauteing, roasting and baking and opt for adding extra flavor through herbs and citrus which pack a ton of flavor without the calories or heaviness. See our article with 10 healthy seasonings to make healthier foods taste good for more ideas. 10. Soda – As you may have seen me mention on the blog, I have quit drinking diet soda a few times now. I love the effervescence of soda more than the taste, however I have found that when I stop drinking diet soda, I really do crave sugar less, not to mention I’m not drinking down all sorts of chemicals. So, I currently will still have a regular soda maybe once a month, and when I want a drink with some effervescence I instead opt for sparkling water (love using my SodaStream for this) flavored with fresh fruit juice like orange, lime or lemon. You can also use bottled juices, just try to find ones that are 100% juice with no added sugar and use as a flavor enhancer, not the beverage star. Implementing small changes like these over time in your eating habits can be major for your health and weight. Unless you really think you can stick to it, don’t go cold turkey or make a ton of changes at once, just ease into it. Before long you might notice you actually prefer the healthier foods over the processed! What are some healthy food choices and alternatives you make?